Since 1976, we've proudly served the music needs of the Greater Los Angeles and South Bay communities. "Vibrational medicine for the mind, body, and spirit." 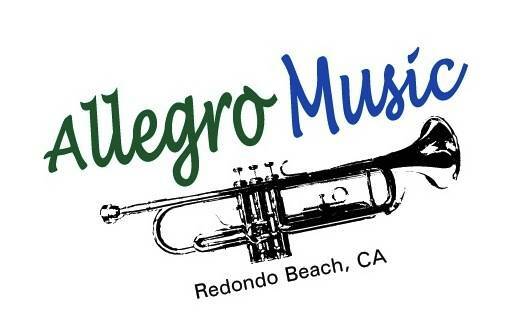 Allegro Music is now located at 2741 Manhattan Beach Blvd., Redondo Beach, CA 90278. Never fear, it is the same shopping center as our previous address, now you simply walk to the northeast corner of the center (closest to Inglewood Blvd.) and there we are!! Dena Merkovsky is diligent in hiring responsible, educated & experienced teachers. Her 18 years of experience has produced a teaching staff with performances ranging from world tours with Whitney Houston, the American Idol Band for CBS TV, The Tonight Show with Jay Leno , Conan OBrien, and David Letterman, Las Vegas main stages and Broadway, NYC. Reserve Your Instrument for the School Year! Now you can reserve any instrument for your child that you can pick up at your convenience or make an appointment for a specific time by calling us directly at 424-757-2060! No need to stand in line! Check out our monthly deals where you can get world class instruments for amazing prices! Pro Yamaha soprano sax, "76" Vintage in prefect condition for sale by pro musician for only $1650! Pro 400 Series Fox Renard Oboe, in perfect condition, adjusted, oiled and ready to go at $3500! for the latest musical news, tips on instrument maintenance, videos and more!